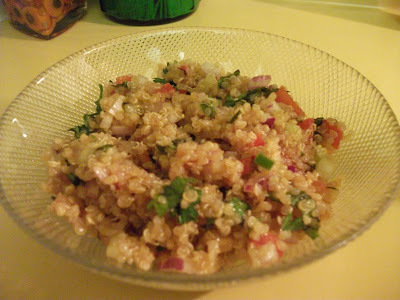 Needing a quick, light veggie dish that I could throw together after a long workday, I made this easy tabouli recipe using quinoa instead of bulghur. Refreshing and full of flavor, this gluten-free version tastes even better the following day. I didn't use quite as much parsley as most recipes call for, but that's just my personal preference. In a large heavy saucepan, combine 1 cup of quinoa with 2 cups of vegetable stock. I like to "toast" my quinoa first by adding it to a medium-hot pan with about a tablespoon of extra virgin olive oil. Stir the quinoa to coat in the olive oil and cook just until light brown before adding the veggie stock. Bring quinoa/stock to a boil. Reduce heat and simmer for 15 minutes (or until quinoa has fluffed up and all the stock has been absorbed). Set aside (while the quinoa cooks, dice the veggies and chop your herbs). In a large bowl, add the cooked quinoa and stir in the veggies and herbs. In a separate bowl, whisk together the lemon juice and extra virgin olive oil. Pour dressing over quinoa/veggie/herb mixture and stir to combine. Taste and adjust for seasoning before serving. I prefer to allow the tabouli to chill in the fridge overnight before serving the next day. Quinoa is awesome eats! Glad to see you working with it!